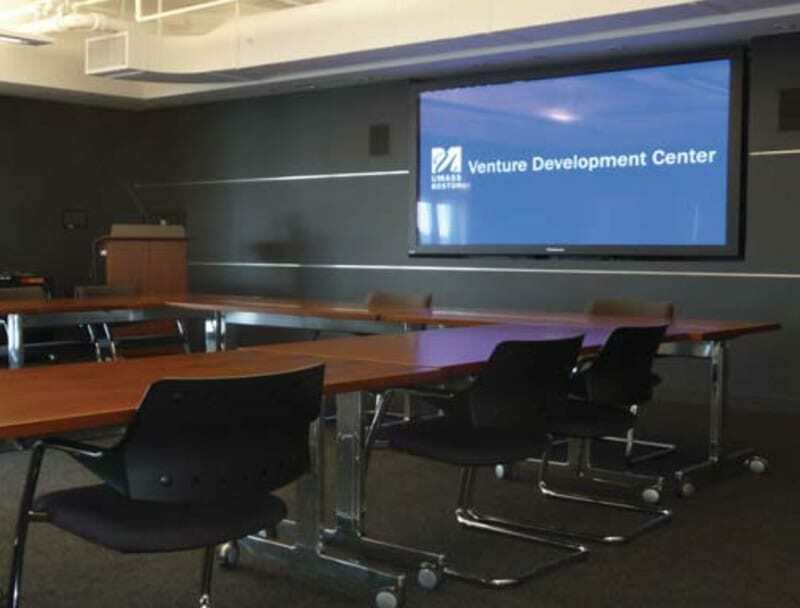 UMass Venture Development Center | SIGNET Electronic Systems, Inc. The University’s plan to build the 18,000 square foot Venture Development Center utilized campus space for laboratory research by students and partner companies and the ability to record and present results within a state-of-the art facility. The space was also to include the ability to communicate with anyone in the worldusingdigitalvideoconferencingovertheWorldWideWeb. The space design included four wet-labs, two dry-labs, a presentation room, two work space areas, a kitchen/coffee bar and a display wall. The challenge included the control and integration of multiple audio-visual sources through the use of a single touch panel control unit located in each room. The touch panel interface needed to be intuitive, seamless and user friendly. Since not one single A/V input/output standard exists, each source may have included a variety of different input/output options creating a myriad of different adapters and connectors required to integrate the devices to each other. While the project was pre-designed, the several connection types, manufacturer product changes, and different cable types created a difficult challenge in itself. An additional dilemma included the installation of the nine foot wide, five hundred pound plasma display. A unique solution would have to be implemented not only to get the display into the limited access building, but also mounted onto the wall. Additionally, due to the high level of user interaction with the end product, the project required constant client contact and coordination including input and approval on the custom touch screen interface. SIGNET Electronic Systems, Inc., through direct coordination with the A/V Consultant, CCR Pyramid, provided a state-of-the-art audio visual system including twelve 50” plasma screens, four 40” LCD’s, eight Crestron touch panels including a wireless model, custom designed touch screen interface, twenty four omni-directional ceiling microphones, sound reinforcement speakers, multiple PC input plates, two digital IP video conferencing codecs, four digital signage units and one of the world’s largest plasma television, a 103” model from Panasonic. The combination of SIGNET’s experienced field technicians, manufacturer trained and certified programmer, and in-house CTSTM, CTS-ITM, C-ESTTM certified engineer, provided a fully functional, highly detailed installation. SIGNET’s project management team kept in constant contact with the end-user outlining progress, potential pitfalls, and acquired the information necessary for the touch screen interface. Through the use of SIGNET’s vast resources and creative management staff, the plasma display was hoisted onto the third floor mezzanine with a crane while the installation utilized mechanical material lifts to elevate the display to the mount. The project installation lasted approximately nine months and was completed within the project deadline. SIGNET has the experience and staffing to meet any and all A/V system integration needs.